There are clear skies on exoplanet HAT-P-11b, whereas infernal winds are blowing high up on HD 189733 b. Today, with their elaborate instruments on Earth and in space astronomers not only discover new exoplanets, but also gain insight into the atmospheres of these distant worlds. In the future they even hope to detect signals of life in an exoplanetary atmosphere. Cygnus is an easy-to-find constellation on the northern sky in summer. Out there, 120 light-years away, a planet that is a little bigger than Neptune orbits a star that is slightly smaller than our sun. The Exo-Neptune being very close to its host star needs only five days for one lap. «It is a pretty warm object, about 600 degrees Celsius» says Kamen Todorov, Postdoc at the ETH Zürich and member of PlanetS. The exoplanet was detected in 2009 by a network of small telescopes on the ground named HAT. Since then, three space telescopes have observed the object: Hubble, Spitzer and Kepler. Analysing the data of HAT-P-11b, an international team recently found amazing details about the exoplanetary atmosphere. «For the first time we could see molecular signatures on such a small exoplanet», explains Kamen Todorov who was part of the team. «So far, all the Neptune-like and smaller extrasolar planets that scientists had observed were covered by thick clouds.» Therefore, studying their composition was impossible. But as it turned out, HAT-P-11b has clear skies, and the team was able to see water molecules. «This is the smallest exoplanet with a direct detection of any molecule – in our case, water vapour», says Kamen Todorov. Another interesting object named HD 189733 b orbits its parent star in only 2.2 days. Discovered ten years ago at a distance of «only» 63 light-years, it has been studied intensely. 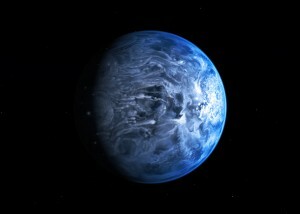 Without seeing it directly, astronomers were able to measure the colour of the exoplanet: It is blue, like Earth, but much bigger, comparable to the size of Jupiter, and hot: «The precision at which we have derived the temperature profile in this remote atmosphere is unprecedented», says Aurélien Wyttenbach, PhD student and member of PlanetS at the University of Geneva. Temperature increases with altitude and reaches more than 3000 degrees Celsius. Analysing the big dataset, collected over years, the Geneva team also found that there are stormy winds blowing from the hot day side to the cold night side at speeds of several kilometres per second. «These discoveries signal the dawn of exoplanetary meteorology», says Kevin Heng, professor at the University of Bern and leader of a PlanetS project that focuses on computing the composition and dynamics of exoplanetary atmospheres. Whereas years ago the discovery of a new exoplanet was a highlight in itself, today astronomers are able to describe different properties of many of them. Astonishingly this is possible without having images of the objects. To date, only a few exoplanets could have been photographed. The first exoplanets were found because their parent stars periodically wobble as a result of the mutual gravitational attraction. The changes of the star’s radial velocity can be measured with a spectrograph using the same Doppler effect that also lets the high pitch of an ambulance drop when it passes you. This signal also reveals the mass of the exoplanet. If the exoplanet’s orbit happen to be aligned edge-on, as we see it from Earth, eclipses occur when the exoplanet crosses in front of its star in a so-called transit. The minute drop of the star’s brightness can be measured and reveals the size of the exoplanet. Combining size and mass the average density of the object is easily calculated. This gives a clue for its chemical composition and shows whether the planet is rocky like Earth or Mars, or gaseous, similar to the giant planets in our solar system. The details about the exoplanetary atmospheres are revealed by studying the remote eclipses when the object passes in front of its star or disappears behind it. This relatively new method is called transit spectroscopy. «Measuring transits and eclipses at several different wavelengths allows one to construct a spectrum of the exoplanetary atmosphere, of which a spectral analysis yields its composition and elemental abundances», explains Kevin Heng.